When I was eight years old, my sister gave me a copy of 'Heidi'. This is the story of an orphaned Swiss girl who went to live with her grandfather in the mountains. Every day she would walk further and further up the mountains, accompanying Peter, the goatherd. I loved this story - still do, but it never really inspired me to go walking on alpine terrain…until now. My fitness walking is generally on asphalt, footpaths, parklands and beaches. Upon taking up Nordic walking, I found that the Nordic poles were ideally suited to those terrains. The Nordic walking poles are designed so you push or propel yourself forward, thereby actively engaging the upper body muscles. Hiking poles are primarily designed for stabilization when walking over uneven tracks, but I had been told that the Nordic walking poles could transfer to tramping, if need be. Unfortunately hiking poles will not successfully transfer to the Nordic walking technique due to the shape of the handles, weight, construction and strap. 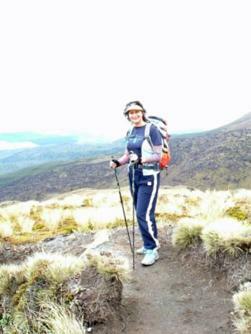 So when accommodation at 'The Park' in the National Park Village, was offered to me, I felt it was a great chance to try the Nordic poles over the Tongariro Alpine Crossing. The terrain on this magnificent day walk is rocky with soft soil and loose scree, interspersed with boardwalks. It is 18.5 kilometers long and quite a hike! The most challenging part is the 900 metre climb up the 'devil's staircase', which is basically a rock wall. However, descending through the scree was rather exhilarating and the long downhill walk back to sea level tested the leg muscles more so than the ascent. My pair of Nordic Walking poles performed magnificently. They provided the stability on the uphill section, giving leverage and helping keep my posture correct, especially as I was wearing a backpack (which often causes people to bend forward from the hips, increasing the likelihood of back strain). On the flat sections, across the South and Central Craters, I was able to stretch out into the regular Nordic walking gait, which increases the range of motion through the shoulders and hips. Without doubt, the poles were absolutely essential on the 11.5 km descent to Ketetahi Road. Any downhill activity places greater strain on the muscles, joints and ligaments. The poles allowed the impact to be reduced, as the upper body muscles helped in lowering the body. It has been apparent to me that most people who are looking to do walks such as the Tongariro or Milford track often do most of their training over the suburban landscape of asphalt, footpaths and parks. It makes great sense to get hold of a pair of Nordic Walking poles to assist in this training. As I have found, the Nordic poles can transfer from asphalt to alpine. June Stevenson stayed courtesy of 'The Park, Traveller's Lodge'. Accommodation options from quality room options to backpacker dorms, self-catered guest kitchen house bar and café. 'The Park' also arranges transport to and from the crossing.